For almost three weeks, opponents of right-wing Wisconsin Gov. 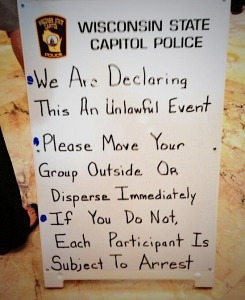 Scott Walker have been subject to police repression while exercising their right to protest. The group, called the Solidarity Sing Along, has been gathering inside and outside the State Capitol Building in Madison since 2011 to sing songs against Walker’s attacks on the rights of poor and working people. The Solidarity Singers’ actions began after the wave of mass demonstrations that shook the state in February and March 2011. The protests were sparked by the state legislature’s attempts to pass the now-infamous Act 10, which, in addition to attacks on social services and benefits, eliminates collective bargaining rights for public employees. For weeks, thousands occupied the Capitol building, physically preventing legislators from passing the law while hundreds of thousands braved the cold and gathered outside. Although the occupation of the Capitol Building was eventually dispersed, the struggle against Walker and right-wing attacks continues. The Solidarity Sing Along has become a visible and consistent presence in support of workers’ rights, and as a result has been targeted by the Capitol Police, led by Chief David Erwin. Last month, a court decision upheld a new regulation requiring groups of 20 or more people to apply for a permit before engaging in constitutionally protected free speech activity. Standing up for the right to protest, the Solidarity Singers refused to obey this ordinance that was enacted with the obvious intention of suppressing their actions. Since the crackdown began in late July, at least 223 citations have been issued to protesters exercising their right to assembly. Over 40 have been arrested simply for singing in a public space, and people who have stopped to observe the demonstrations have also been threatened with arrest by Capitol Police. The Solidarity Singers refuse to be intimidated and are continuing their actions to speak out for poor and working people. As the police continue their attempts to break up the protests, and as dozens of arrested Singers proceed with a jury trial, support from progressive people and organizations across the country has never been more important. Click here and “like” the Solidarity Sing Along’s Facebook page to stay updated about the latest developments in this struggle.